Comes in a stickered, plain black die-cut sleeve. 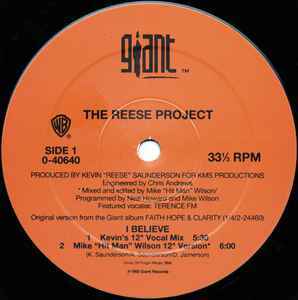 The release is stickered to say it is available on Compact Disc Maxi-Single and Cassette Maxi-Single, but no such releases have been submitted to Discogs. I am wondering if they even exist. You know, this is a good record - not spectacular, but for some reason it just really grabs me. It has a really classic Chitown deep house sound to it, but it would not necessarily be worth tracking down if it were not for the Carl Craig mix of the track. Craig takes out the vocals in favor of this moody, ethereal affair and what can I say - this is the first thing I ever heard by him, and I have been a fan ever since.